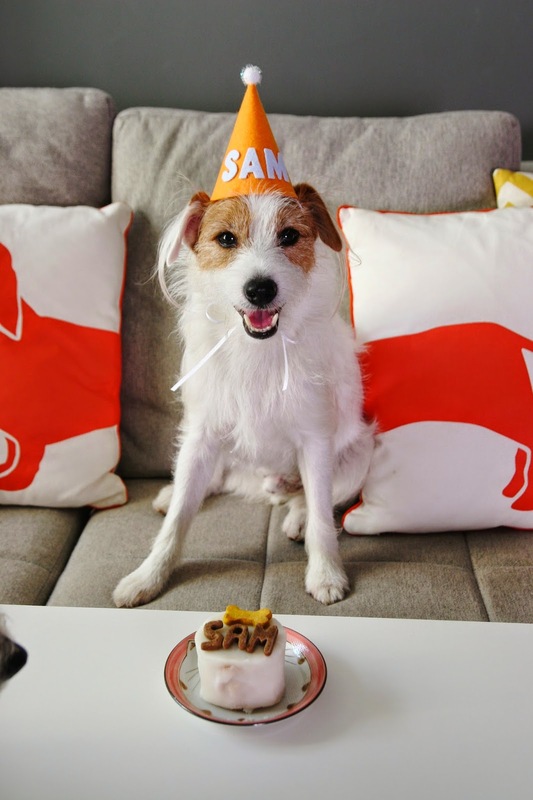 Happy 5th Barkday to Sammy Loo! Yap, it's the time of the year once again. 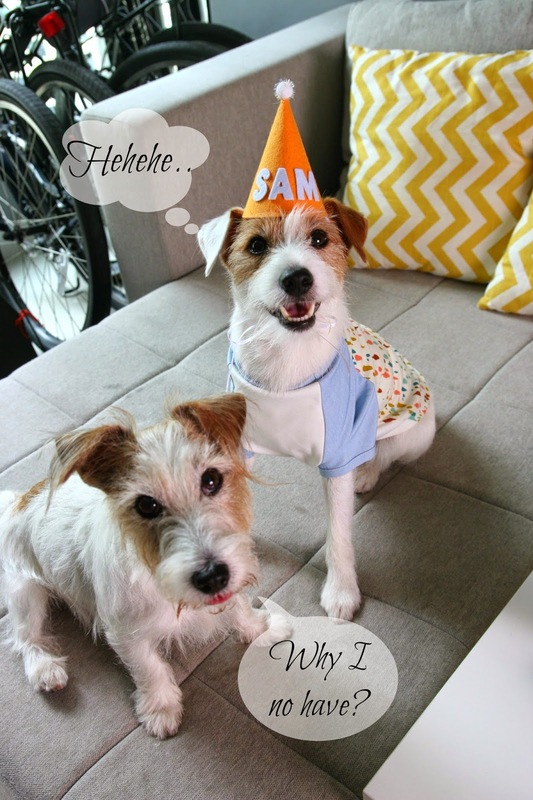 Little Sammy has grown one year wiser. To celebrate my bark day this year, Mummy decided to gift me not one, not two, but FIVE pressies (one for each year of my life!)!!! To kickstart the celebrations, Mummy got us customised hats from The Lil' Rascals! 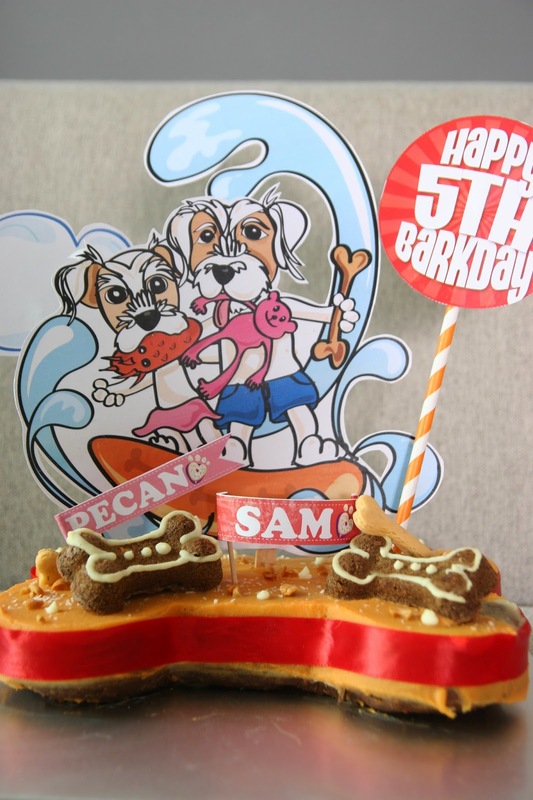 A customised Birthday Cake from Pawlicious Bakery! There's no birthday without a birthday cake! Hehe, since we had their signature fondant figurines for our Barkday last year (fyi: the figurines are still intact and sitting around in the house! ), we decided to change things up a little. So, Mummy got Auntie Jaster to illustrate us doing our favourite activity in the world - rescuing drowning toys! And she came up with this awesome cake!!! Okay la. I think Mummy loved it more than we did. We just wanted to sink our jaws in it. In fact, ah ma managed to steal a bone midway during the shoot and ran away! Oh well, at least I got first sniff. Needless to say, we devoured the cake (or rather, the portion Mummy cut out for us) in seconds. 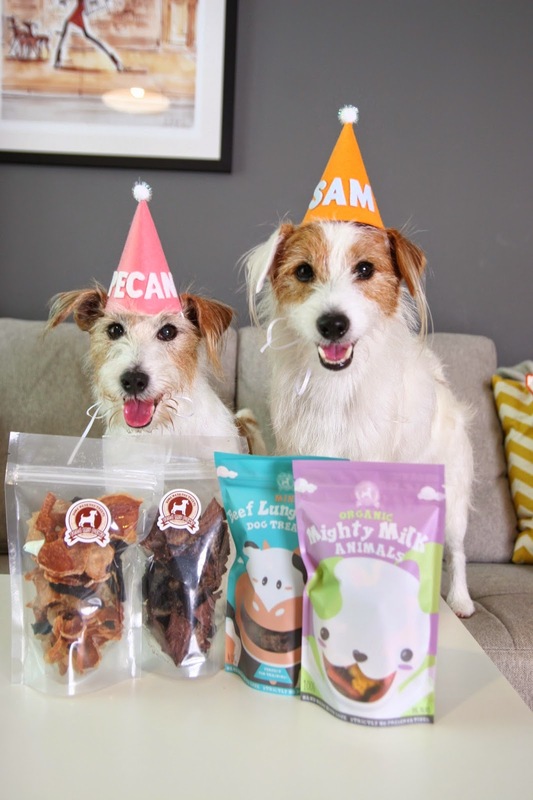 A birthday Stash of Feed My Paws Treats! Nothing beats getting tons of yummy treats on your birthday. As one of my pressies, Mummy gave me a budget and allowed me to choose what I wanted from the online store! So, I chose my favourite Beef Lungs and some adorable Mighty Milk Superfood Animals biscuits! PS: We love the new packaging! I also decided to try something different by ordering the Mixed Porky Bits and Mixed Beefy Bits. Mummy says that these reminded her of Ben's & Jerry's Everything but the... ice cream as you won't know what you're gonna get when you pick a random piece. The very sweet Auntie Crystle also baked me a special mini cake for my birthday! HEHEHEHE... Sammy's tummy says THANKS! Just coz there's no such thing as too many beds! Hehe, I'm loving my brand new bed. And of course, someone has to squeeze her way in. After some pacifying by Mummy (in the form of a bottomless treat buffet), i decided to close one eye and let Pecan ah ma share it with me. Okay, this...I felt that I got cheated. So, this is actually my virgin stripping session! 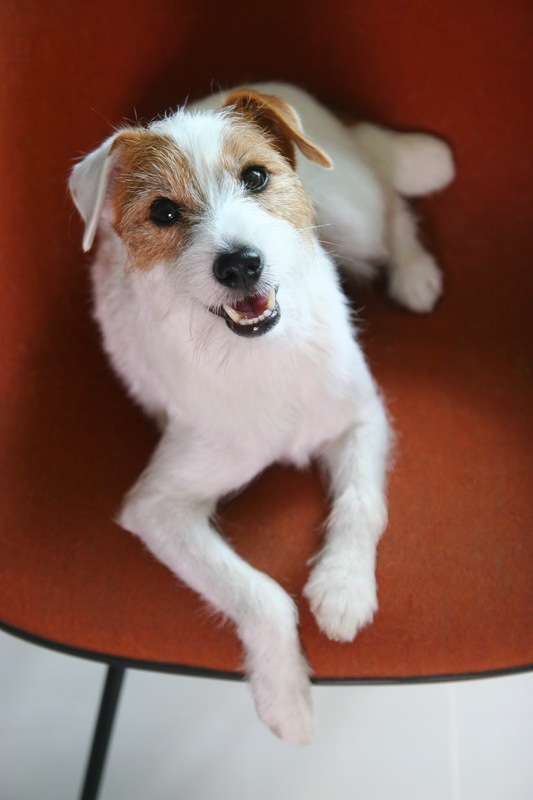 And oh boy, my coat hasn't never looked shinier nor felt smoother. Best of all, I'm shedding a lot less now. Mummy was a little sad that my pony tails got snipped off. But oh well, it will grow back in a couple of months la. Meanwhile, Sam is officially show-worthy hor. Too bad, I am still missing my balls. A Oh! Basic Raglan from Ohpopdog! Since everyone is so used to seeing me in my birthday suit, Mummy wanted to go the opposite way and proceed to buy me something nice to cover up with this barkday. Sigh~ Where got so handsome one? I'm not usually fond of wearing clothes. But I'm extremely pleased with this outfit...simply because I got one while Ah ma didn't. But the truth is, this shirt is seriously comfy and works great for the local weather! With this, Mummy certainly doesn't have to worry that I will overheat when wearing it for an outing! So, keep a lookout of the brand new Sam in clothes wor. For once, I wish I was wayyyyyy older. Then the list will keep going. Anyway, I've to admit, this is possibly one of my best birthdays ever..
Hehe, looking forward to six awesome pressies next year! But wait a minute... does this mean ah ma gets twelve this year? !